It is Tom Yum Koong, famous Thai Sour & Spicy soup. 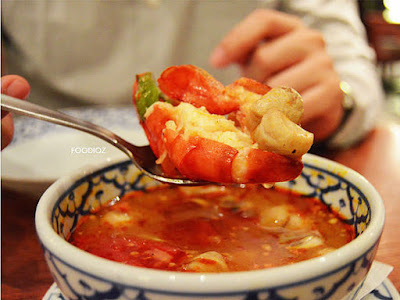 Usually, this soup using few kind of seafood like prawn, squid, or fish. But in Jitlada, they are serving each soup is for one person only and the only sea creature i found there is only a prawn and some of mushrooms, few seasoning leaf. From taste, it is good sour and spicy, great seasoning. But one bowl is not full enough for my tongue to taste :-) Then we have Basil Beef. 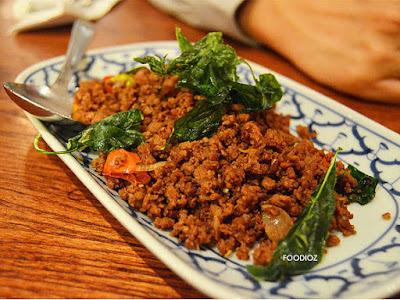 It is pan fried minced beef with crispy basil leaf. Beef taste great, nice seasoning, some chilli made spicy and smell of basils really good. 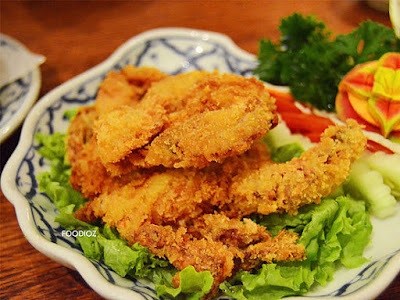 And last dish is Mayonaise Soft Shell Crab. Fried shell crab looks stunning. It is very crispy, but just little under seasoning, even though its served with mayonaise sauce, but more seasoning for the crab should be better. And also, there's a smell of scorched. Taste like, the oil used before to cook another dish. I am not sure if it smells from the crab but it does affected the crab under seasoning. All over foods are good, but the crab can get better i hope :). Basil beef is one of best. Place is fine, even though the lights bit obscure, but it is suitable with the concept restaurant. The price, it is not cheap as traditional food compare if visiting Thailand, we may found their foods much cheaper just like street foods here. But as it restaurant, we pay more for better service and place :-). 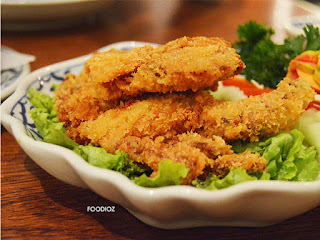 Thai food lovers, should try this at least.